I don’t often spend money on myself. I never really did. I’ve always been a bit frugal and becoming a mom only increased my frugality. At least, when it comes to things that are for me and only me. Not many dresses meat those criteria. This one does. Still, I felt a bit guilty after buying it. I felt a bit guilty until I had worn it twice and had already tossed it in the washing machine in preparation for the third wear. Spending $70 on a casual summer dress is a bit extravagant but, if done only once a year, it is also manageable. There is value in me feeling good and comfortable because those things make me happy and when I’m happy, my children are happy and happy children are worth their weight in gold. And still, I find myself calculating what else I could have spent that money on – ten new picture books, 20 ice cream outings, 70 rides on the carousel at the park. Another small but important chink in the huge rock that is future college tuition. These calculations often keep me from completing a purchase. Instead, I spend a lot of time window shopping. I scroll and browse. I carefully select items in just the right color and size and then I put them in my cart. Ten minutes later, with a cart full of items I like, I click the little x on my browser and I leave. I have scattered the Internet with abandoned shopping carts. Earlier this week, I followed a link from one of my favorite bloggers to Sevenly. I’d heard of Sevenly before because I follow Get Milkshake (which is awesome and inspiring and I can’t recommend enough). I’d spent some time looking through Sevenly’s products in the past, but never bought anything before. I’m certain I’ve abandoned a few lonely items in shopping bags there too. But last week, Sevenly’s cause of the week was Lettercase, an organization that provides information and support to expectant parents when they first receive a prenatal diagnosis of Down syndrome. I don’t personally know anyone affected by Down syndrome. But there was this scare just before my daughter was born. And I remember those very early days after she was born, healthy and happy and easy compared to the babies I’d heard of with colic and crying and sleeplessness, but still new and overwhelming and other things I can’t express with words, only with tears. And I can’t imagine feeling all of that and then having Down syndrome resting on top of it all. I can’t imagine any diagnosis like that. How do you deal? How do you cope? Where do you start? So I scrolled and I scrolled and I found this shirt. Love. Beautiful and simple and lovely. So I clicked and selected my size. And I added it to my cart. And then I looked around some more. I hesitated and second-guessed and looked around to see if maybe I should buy something cheaper. I left the site entirely and wrote a little of a blog post and busied myself with other things. But then I went back. And I bought the shirt. It came to $33. That’s about 10 cake pops, my daughter’s favorite afternoon treat. It’s an afternoon at the pool to celebrate the upcoming long weekend. It’s another small but important chink in tuition. And so I felt guilty. Until Sevenly prompted me to tweet about my purchase. And so I did. Helping to prepare an expectant parent to not just survive but thrive with the blessing that is a child, no mater how many chromosomes that child brings with them into the world? That is worth so much more than a cake pop or an afternoon at the pool. Frugality is important. Carefully considering where we spend our money, because we have so very many options these days, is important. Not completing my transaction every time I fill a virtual shopping bag is also important. But, sometimes, it’s important to leave the guilt and the calculations and the cake pops out of it and just do it. For happiness. For others. What have you recently felt guilty for buying? What have you recently not felt guilty about buying? This post is not sponsored and none of those links are affiliate links. I just really love Sevenly and Get Milkshake and, of course, Enjoying the Small Things. Ugh, I never spend money on myself. And when I do, yes I calculate the cake pops it could have been (my daughter’s favorite too) and how many shirts my one shirt could have bought my son. And other times I calm down. They have so much that we almost need a new house for them! I don’t have much and my body is at that weird in-between too. I need a new dress. 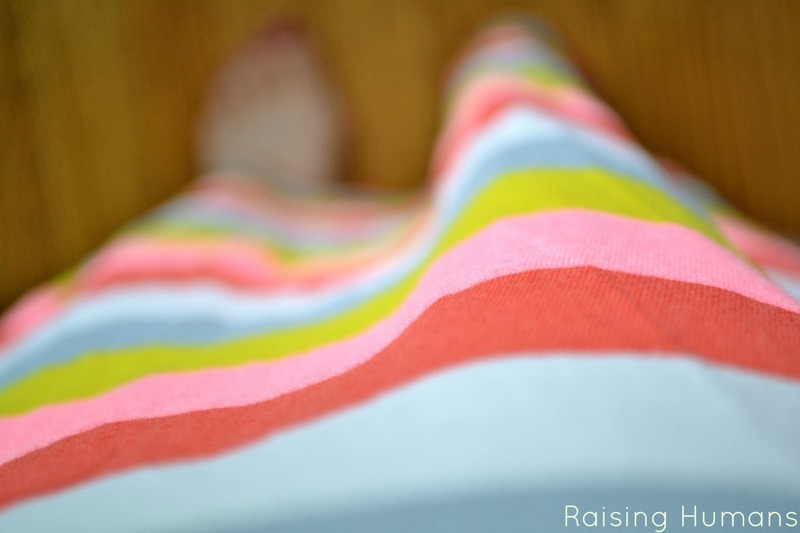 That rainbowy maxi is wonderful! I LOVE this Sevenly website. I’m going to look around right now. Tamara recently posted..Another Year Gone, Holdin’ On. I am feeling a little guilty about spending this year on a membership to the town pool. It’s expensive and not in the budget. but the kids live for it each year. I didnt have the heart to say no. I will make up for the expense somehow! I need to check out sevenly! I’m terrible about spending money on myself. I always find other things that we need instead. But then it eventually gets to the point where I realize it’s okay to get something for me sometimes, too. I spend whatever money I have to spare, on the boys. That is, until this year. This year, I decided to be nicer to myself. So I’ve bought books, a yoga mat and a couple of yoga tops. Doing something for myself has done wonders. It’s made me a better mother and wife. I think that what you did, contributing the way you did, and in the process, bring hope to someone else, is great!